One of my favorite things about dragonflies (I have many!) is the way their way their wings play with light. Since we live along the shore of the Swan River, we often get to sit and watch the dragonflies skim along the edge of the water as the evening light begins to fall. Their beauty and grace in the air only add to the beauty of their iridescent wings. 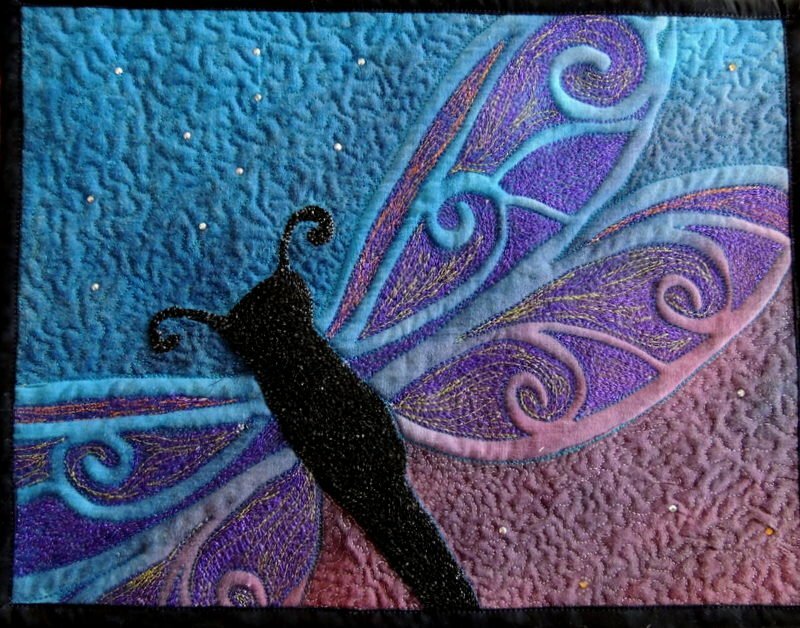 I began this work with hand painting the background and then sun-printed the shape of my dragonfly. I then used a combination of thread painting and bobbin work (placing thicker threads in the bobbin of my machine and working from the back of the piece) to create the multiple layers and thickness of the body. Lastly the piece was layered, quilted and bound.